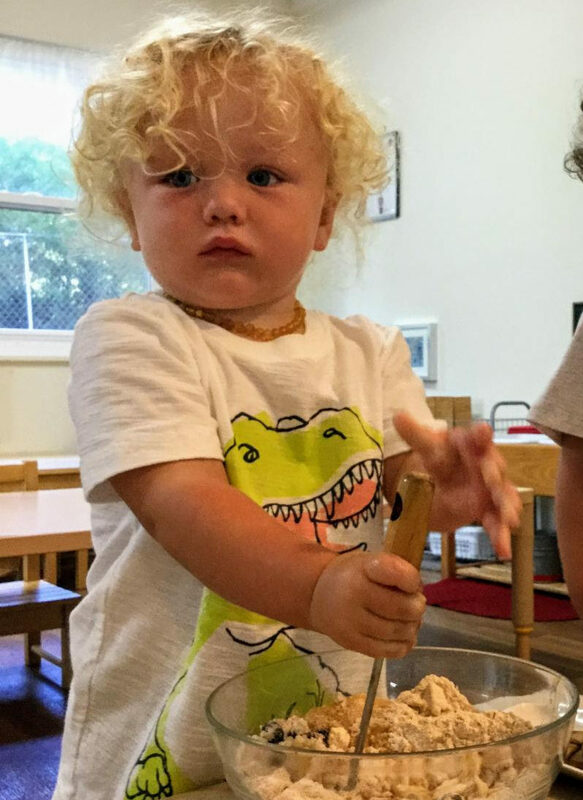 View our Primary Q&A (ages 3-6), an interactive online webinar where participants asked our Montessori expert about situations they are dealing with right now. Every time we host an infant/toddler Q&A webinar, questions pour in on the topic of potty training! When is the ideal time to start the process? If we started a bit late, what now? How should we handle “accidents” at home or school? 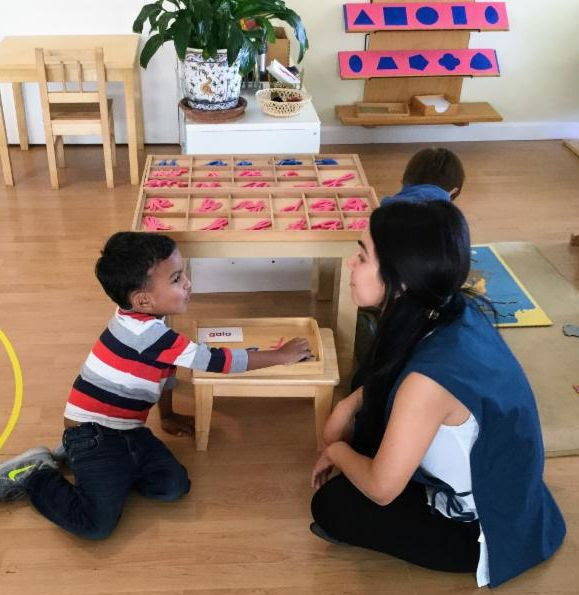 On March 19, we offered an entire webinar on the Montessori approach to potty training, led by our resident expert on Montessori for infants and toddlers, Alejandra Rosas. Join Lyle Weinstein and Greg MacDonald for an eye-opening webinar based on their new book, The Montessori Alzheimer’s Project: Bringing Montessori Insights to Dementia Care. This webinar provides an introduction to the Montessori Alzheimer’s Project (MAP) and its approach to home care of loved ones who have dementia. 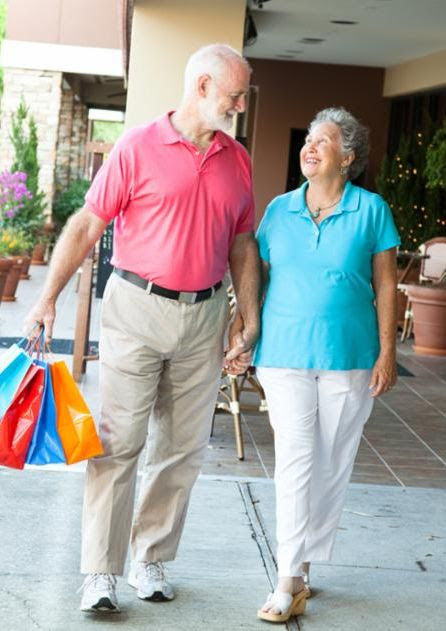 How Montessori principles can be applied immediately in anyone’s home to support Alzheimer’s patients and their caregivers, creating a constructive path of kindness for all. How the MAP approach can make it possible for a person who has dementia to stay home for longer, in a safer and more supportive environment. How MAP has the potential to make that time at home more joyful for everyone. How Montessori principles can engage aspects of memory that are still active in a person suffering from dementia. Do you have an infant or toddler in your life? Would you like to learn how to create simple yet profoundly effective environments that support very young children to reach their highest potential? Did you know that about 1 in 6 children in the U.S. has a developmental disability? 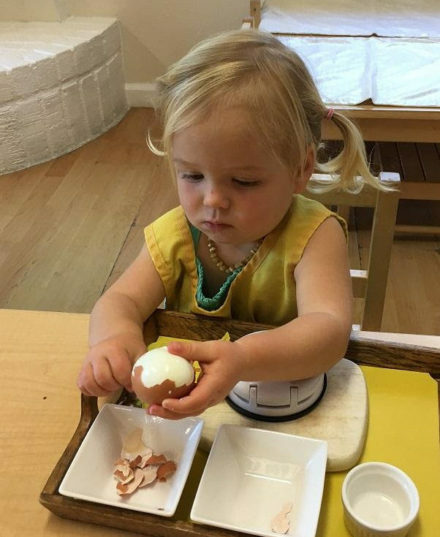 Are we prepared to welcome the full range of these exceptional children into our Montessori classrooms? Download the 2018 Inclusive Education Brochure. Today, babies and toddlers often find themselves confined to cribs or strollers, and relegated to the sidelines as the well-meaning adults in their life “help” them with tasks they would happily do by themselves. What if these children were given the opportunity to act more independently and learn from firsthand experiences in their environment? What kind of adults would they become? 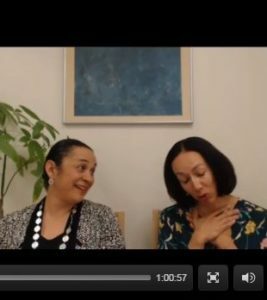 Dr. Silvia C. Dubovoy, Founder and Director of Training at MISD, and Theresa Contreras, M.F.T Behavioral Consultant, held a lively discussion about how to address children’s challenging behavior. What is the impact of behavioral challenges on the individual, peers, teacher, & community? Educating others to respond to a child’s challenging behavior. Techniques and strategies that can help manage the behavior. How do learning differences relate to behavioral challenges? Dr. Silvia C. Dubovoy, founder and Director of Training at MISD, held a lively discussion about how Montessori primary environments help children to develop executive functions. Focus was on the child from 3-6 years. Why are they important for children to develop? 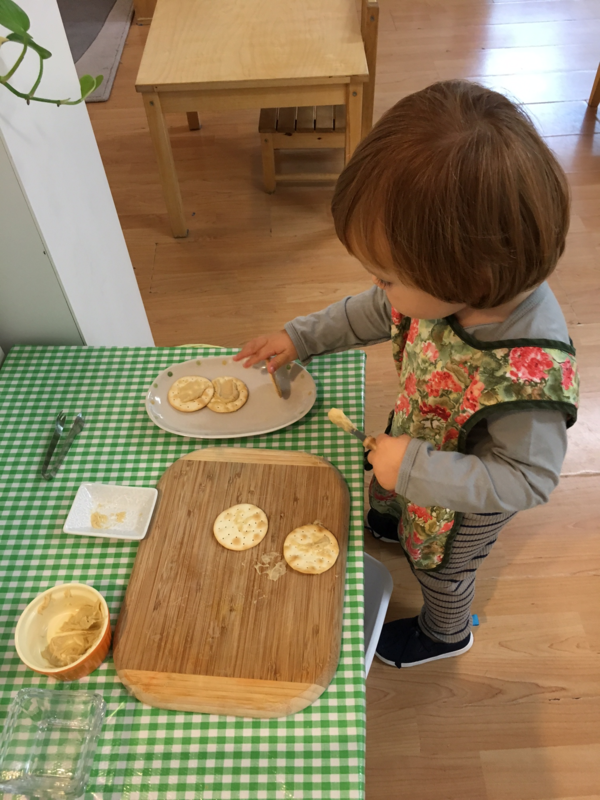 How Montessori environments provide opportunities to exercise inhibitory control, working memory, mental flexibility, etc. An interactive online experience with Greg MacDonald, Director of Elementary Training. 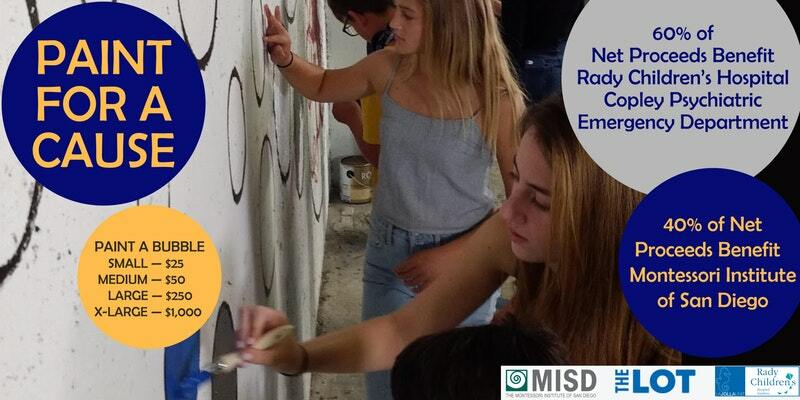 Included Question/Answer Session and overview of upcoming courses at MISD. What is the scope of the Montessori Elementary Geometry Program for ages 6-12? Why is it such a unique program? 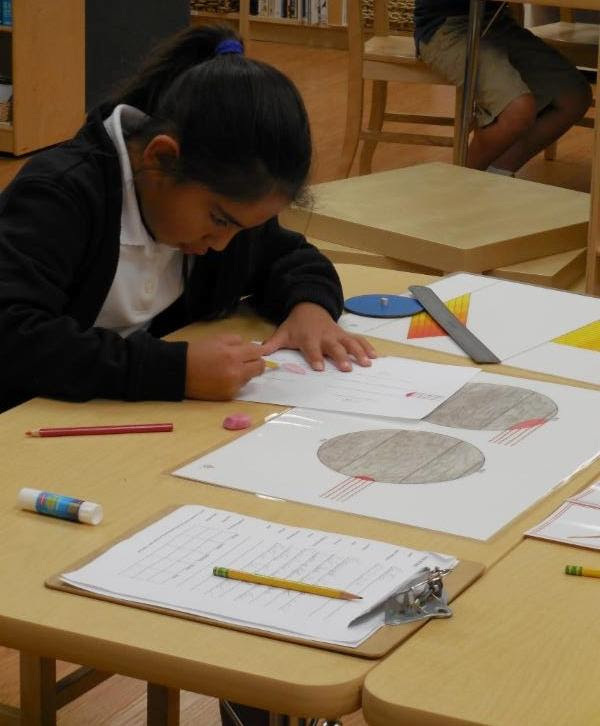 What does a Montessori elementary Geometry lesson look like? How is this program introduced to MISD elementary students? This was a live webinar guided by YOUR questions. Our panelists were Dr. Silvia Dubovoy and Cristina De Leon, two MISD faculty with decades of Montessori experience and an abiding love for children. Dr. Silvia C. Dubovoy, founder and Director of Training at MISD, held a lively discussion about why observation is one of the most powerful tools a Montessori educator can use to transform his or her professional practice and overall relationship with children. What do we mean by self-observation? True objectivity— is it possible? Paint a Bubble in the Parking Garage of the LOT La Jolla! Following the opening ceremonies, the pubic was invited to a Pediatric Mental Health presentation featuring Dr. Silvia Dubovoy, teacher, trainer, lecturer, consultant and examiner for the Association Montessori International (AMI) Worldwide, Dr. Jay Giedd, who chairs the Department of Child Psychiatry at Rady Children’s Hospital, and Pilar Cardenas MFT, Marriage and Family Therapy provider. Many participants came and made thier mark on the community, while supporting Rady Children’s Hospital and The Montessori Institute of San Diego. Our community came together for this mural project that is raising awareness and funds for the greater good of our local children all across San Diego county. Bubbles were painted by children, adults, school groups, Girl Scout/Boy Scout Troops, community groups. Participants also purchased a bubble to be painted by a Rady Children’s Hospital patient or representative or a Montessori Institute of San Diego student or instructor. 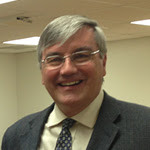 Our presenter was Greg MacDonald, Director of AMI Elementary Training for ages 6-12. 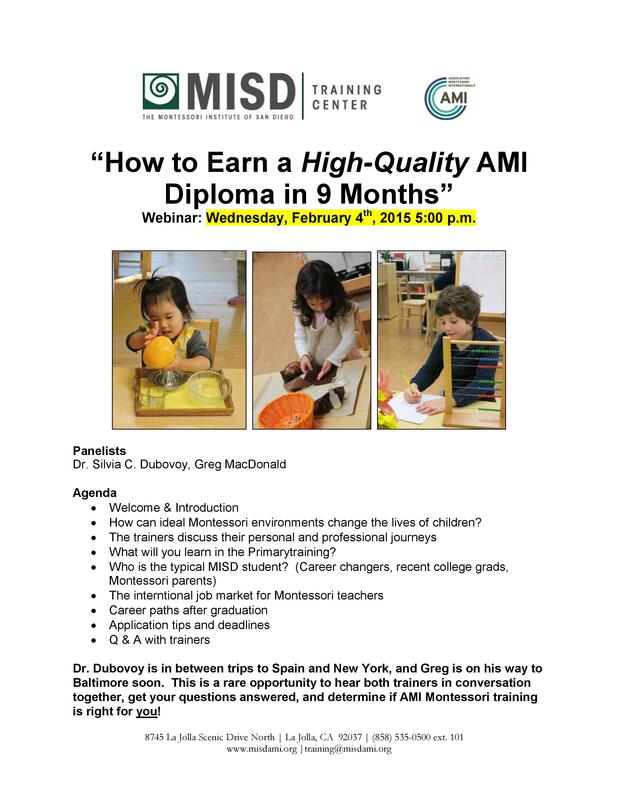 This was a great opportunity for participants to interact with an internationally renowned Montessori expert, have their questions answered, and determine if AMI Elementary Training was right for them! Freedom, Obedience, Authority, and Discipline was an interactive online webinar including a LIVE Question/Answer period. 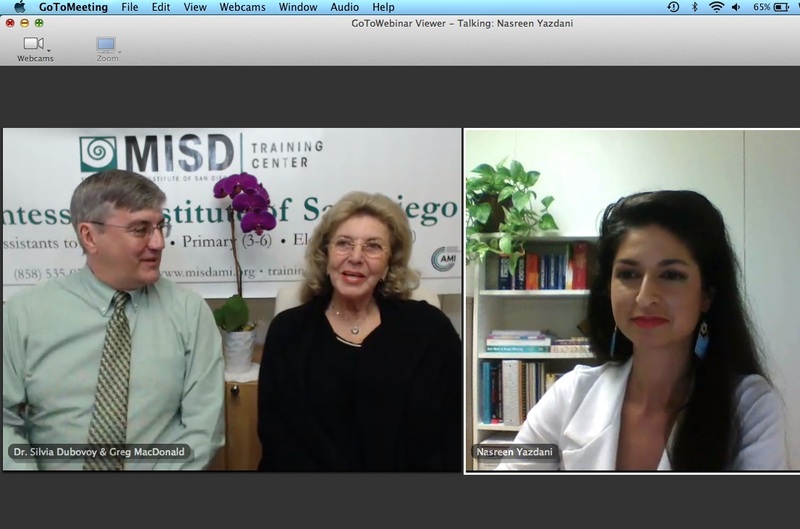 Our panelist was MISD founder, Dr. Silvia C. Dubovoy. 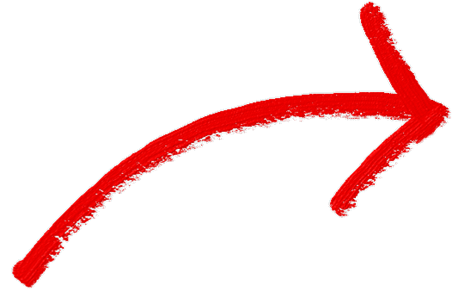 Click here for Q&A recording and supplemental materials. 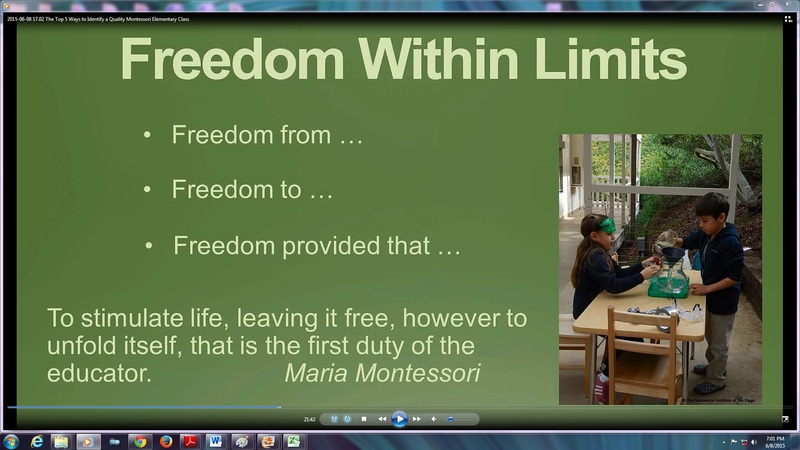 What does it mean to be free in the Montessori Environment? Introduction to Montessori Elementary Training: Language, was an interactive online webinar including a LIVE Question/Answer period. Our panelist was Greg MacDonald. 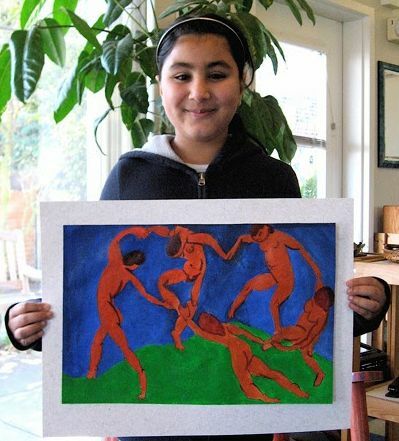 What is the scope of the Montessori Elementary Language Program for ages 6-12? What is the rationale behind the emphasis on grammar? Is there room for creativity? 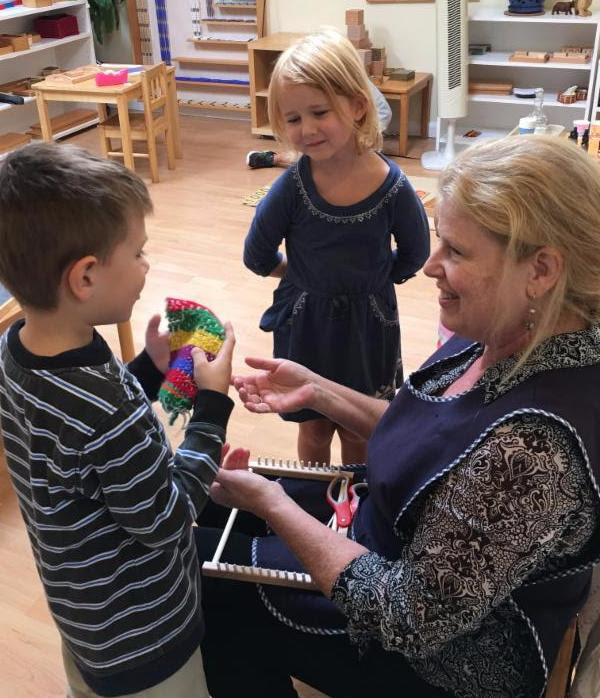 What does a Montessori elementary Language lesson look like? Introduction to Montessori Elementary Training: The Arts, was an interactive online webinar including a LIVE Question/Answer period. Our panelist was Greg MacDonald. View our free Primary Q&A webinar! Our panelist was Cristina De Leon, a beloved MISD teacher trainer with decades of Montessori experience and an abiding love for children, who answered participant questions! Do you work with infants, toddlers, or young children? View our Birth to Six Q&A, a live webinar guided by particpants’ questions. 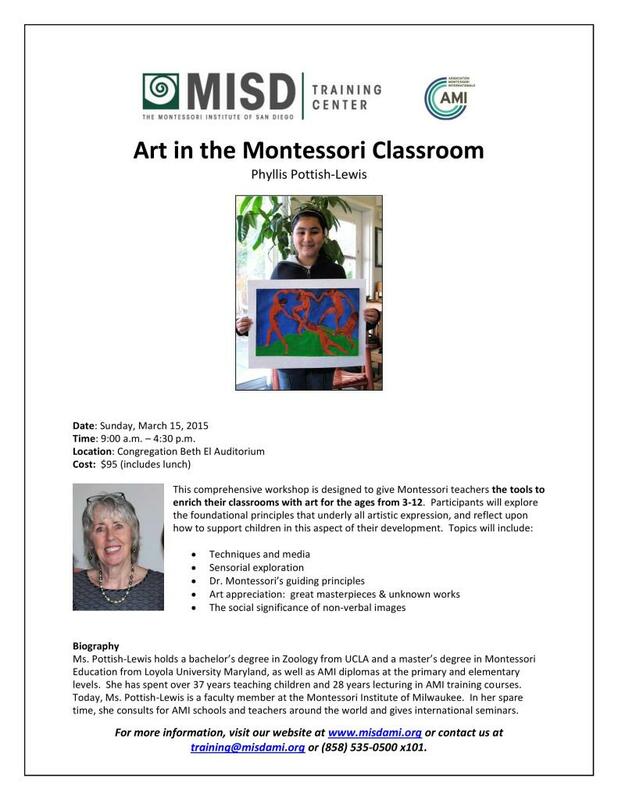 Our panelists were Cristina De Leon and Alejandra Rosas, two MISD faculty with decades of Montessori experience and an abiding love for children. Si tienes ninos en tu vida y te gustaría aprender como crear ambientes simples pero profundamente efectivos que apoyen a los niños en alcanzar su maximo potencial, te invitamos a ver la grabación del último seminario que tuvimos con la Dra. Silvia Dubovoy llamado “Educación Montessori Preguntas y Repuestas”. Cómo llegar a ser un educador Montessori con certificación AMI. 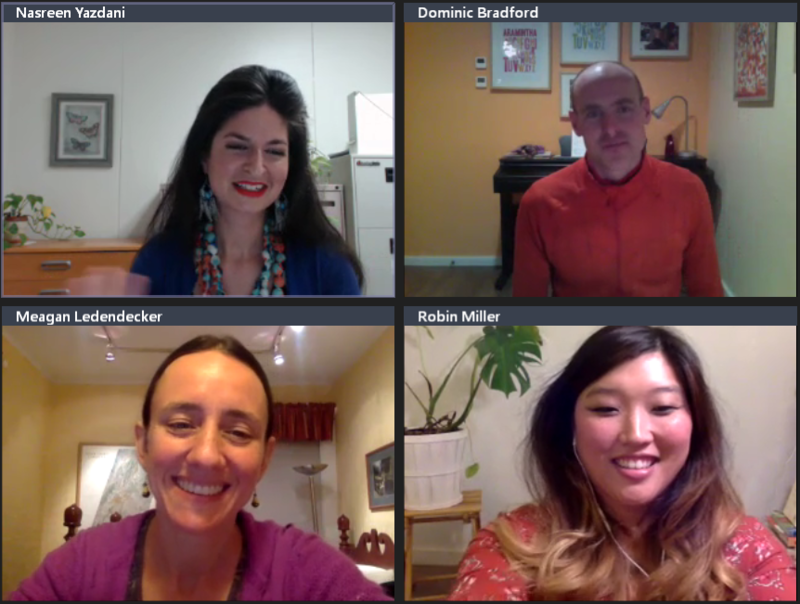 This spring we held our first series of Online Alumni Panels! MISD alumni from all over the world told their stories and answered participants’ questions. Content is directly relevant to prospective students, but many others will find these panels of interest. Greg MacDonald, Director of Elementary Training (ages 6-12) at the Montessori Institute of San Diego, guided webinar attendees through an overview of AMI Physical Sciences teacher training. Greg MacDonald, Director of Elementary Training (ages 6-12) at the Montessori Institute of San Diego, guided attendees through an overview of AMI elementary teacher training with an emphasis on one of his favorite subjects–mathematics! On January 10th, 2017, Dr. Silvia C. Dubovoy and Alejandra Rosas, held our first ever infant and toddler webinar guided by your questions! 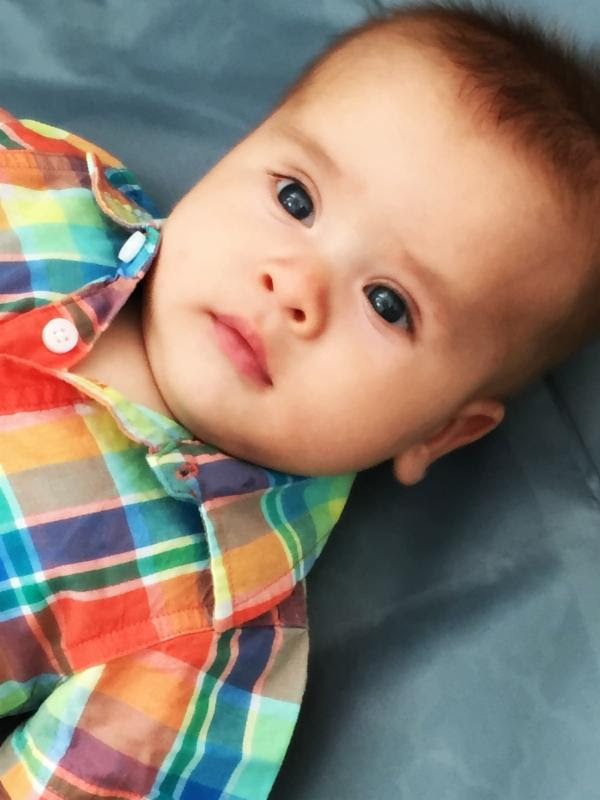 Five hundred participants from all over the world consulted our esteemed Assistants to Infancy instructors live! Notes: This event was open to current MISD students only. 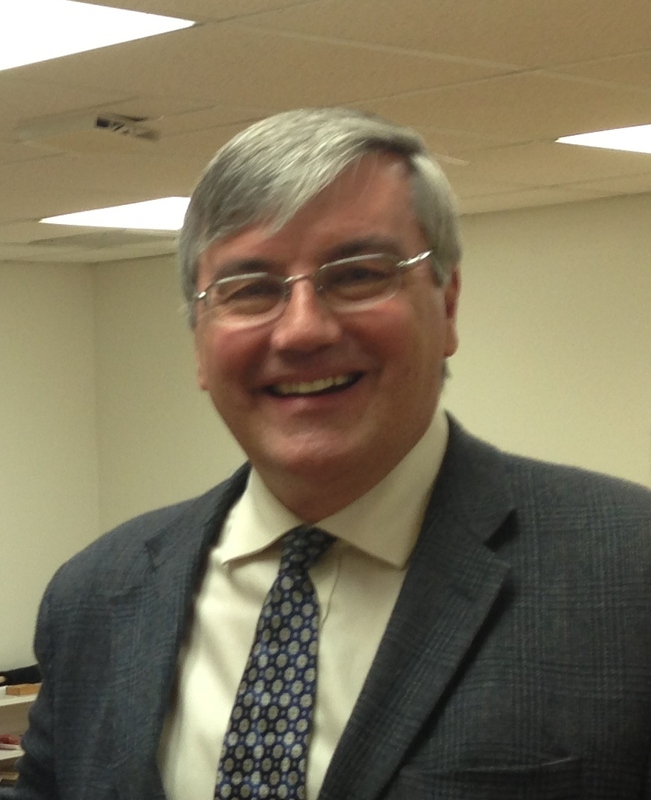 Dr. McNamara is a medical doctor who holds an M.D. as well as the AMI Elementary Diploma (she took the course with our own Greg MacDonald!). Her presentation included an introduction and overview of the last 70 years of neuroscience research for adults who work with parents, infants and toddlers, preschool aged children, latency (elementary) aged children, adolescents, and young adults, with a healthy bias towards birth-age 12. The presentation demonstrated to Montessori practitioners that their Theory albums are actually 100% in concordance with what neuroscientists are learning about neurotypical child brain development. It also taught participants how to read and interpret the fMRI and other neuroimaging studies that will continue to be published/released as part of the NIH Connectome project, financed by U.S. taxpayers over the past 8 years. Too much time spent on crafts? 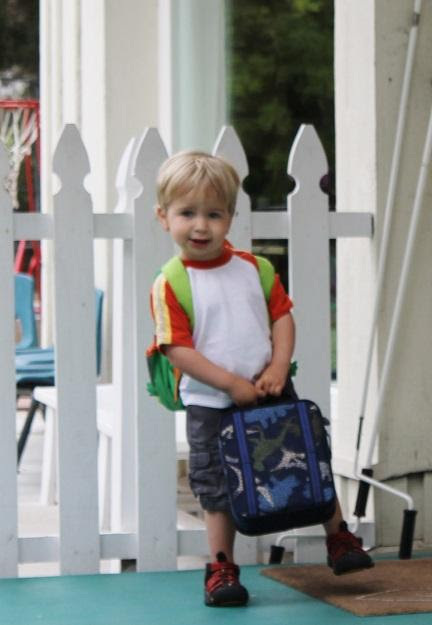 How do I know if a child is ready to transition to Elementary? How can I increase the number of presentations I’m giving? Is homework helpful? How do I get children to do it? Is Montessori compatible with Common Core standards? How can I increase the number of presentations I am giving? Is homework helpful? How do I get the children to do it? 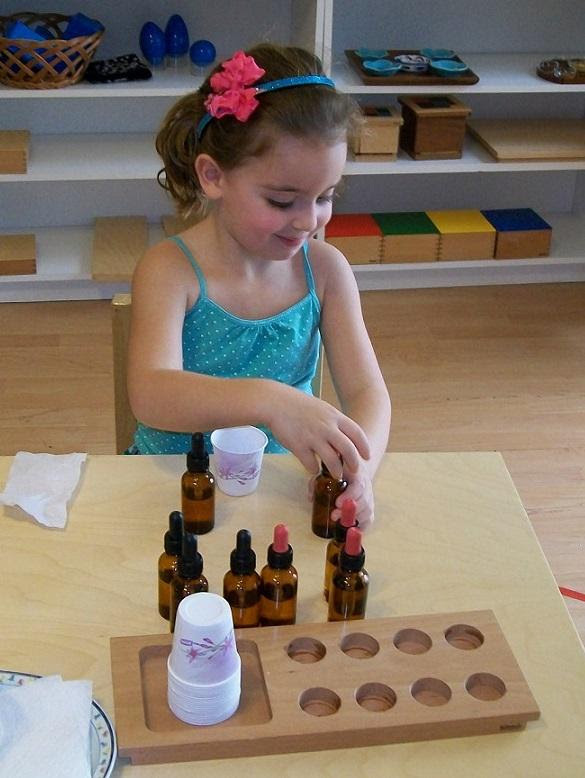 Is Montessori compatible with the Common Core Standards? This webinar was accessible online from anywhere in the world. What is the AMI Inclusive Education Course? 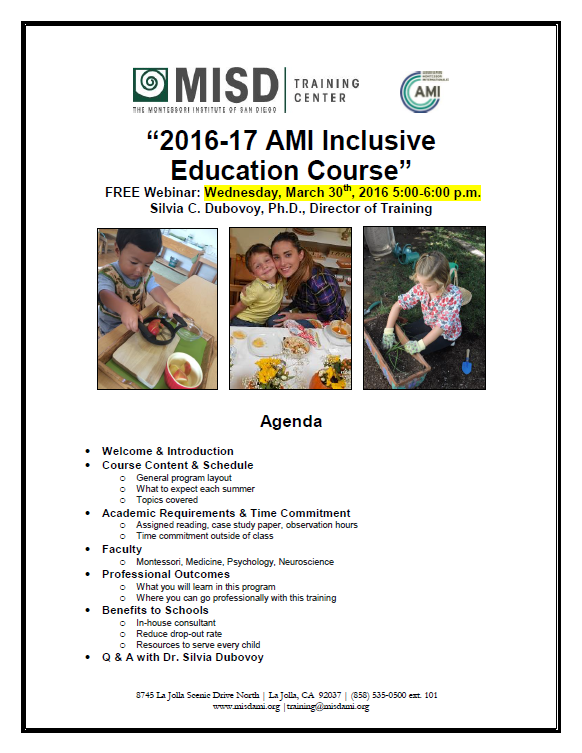 On March 30th, 2016 at 5:00pm, Dr. Silvia Dubovoy shared an inside look at the upcoming Inclusive Education course! At the end of the presentation, there was a lively Q&A with Dr. Dubovoy! On March 16th, 2016 at 5:00pm Greg MacDonald, Director of Elementary Training, answered more of your questions, LIVE! The first Q&A was so popular that we brought it back for round 2 (see upcoming events for round 3)! 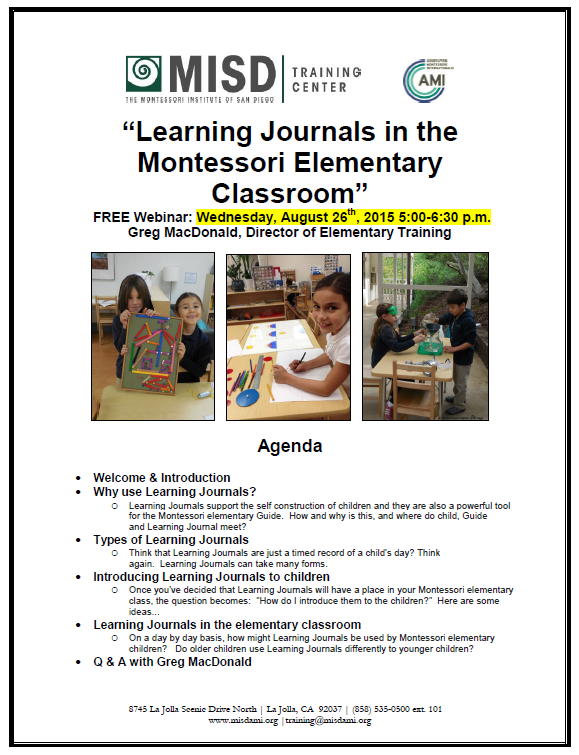 On February 24th, Greg MacDonald, Directory of Elementary Training, answered your questions about Montessori at the Elementary level, live! This webinar was accessible online from anywhere in the world! 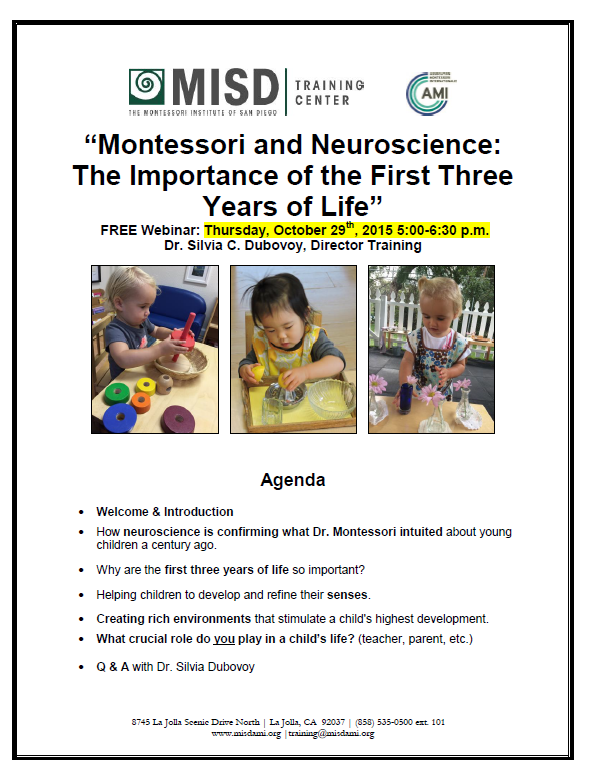 On October 29th, 2015, Dr. Silvia C. Dubovoy, Director of Training at the Montessori Institute of San Diego, gave a FREE webinar on the importance of the first three years of life. 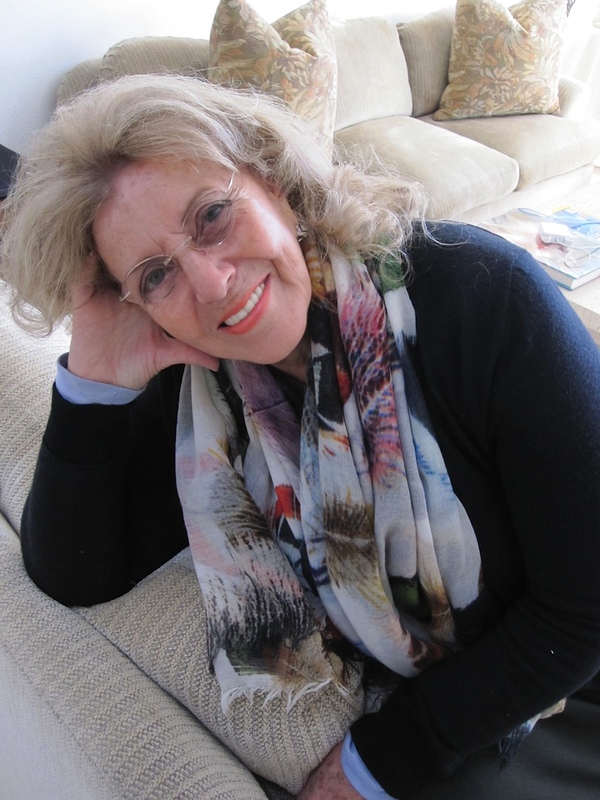 Dr. Dubovoy’s comments were informed by recent discoveries in neuroscience and her long career as an international AMI Montessori teacher trainer. If you would like to hear a recording of the webinar in its entirety, click here! We were very excited to hold our parent education night and open house for the 2014-15 elementary classroom! What actually goes on in the Montessori elementary? What on earth ARE those activities and materials my child keeps telling me about? 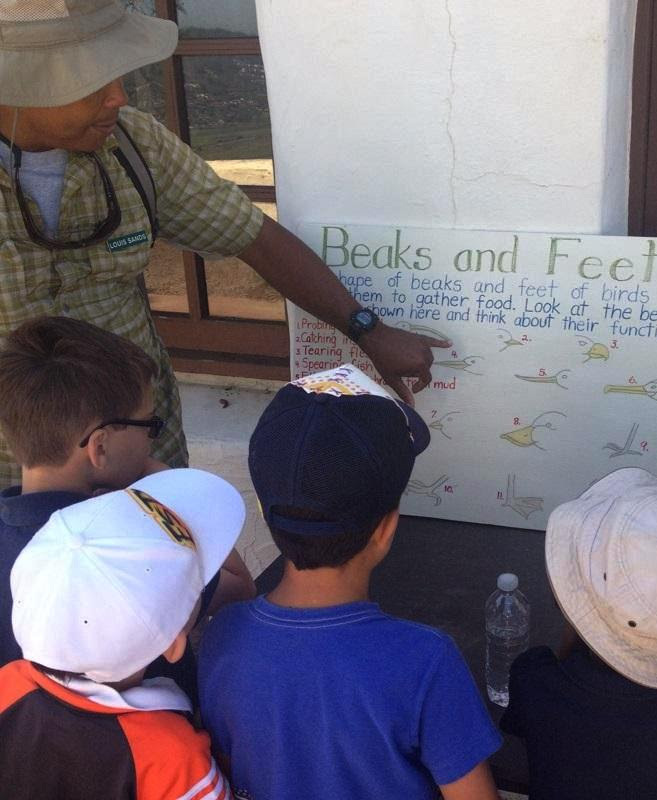 What does an elementary “lesson” look like? 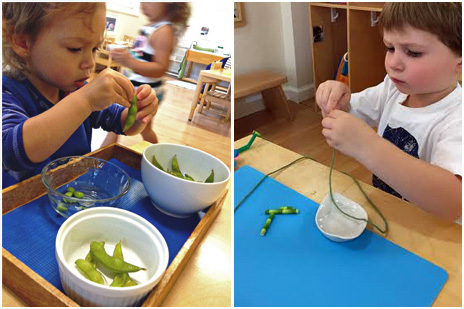 What does a child’s work in the Montessori elementary look like? How does all of this help my child? Are you a parent of a primary child who wonders how the work they are doing now will prepare them for work in the elementary years? 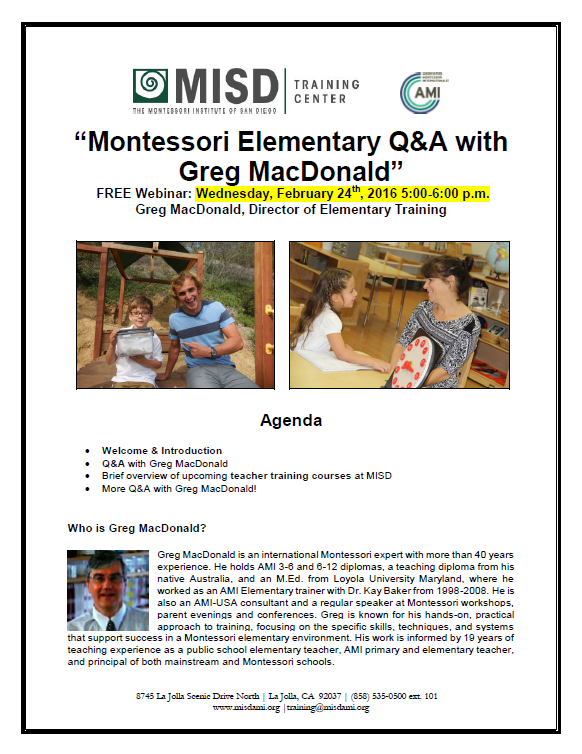 Greg MacDonald, a longtime Montessori practitioner and Director of Elementary Training here at MISD, spoke about these and other aspects of the Montessori elementary program. Parents and other attendees saw, and had the opportunity to take part in, some Montessori elementary presentations. We hope they all gained a greater understanding of all that the Montessori elementary program has to offer. 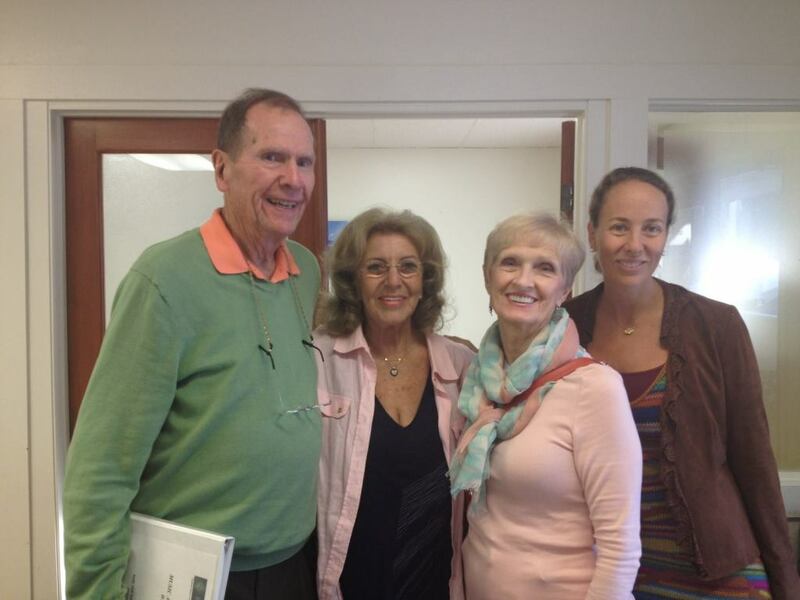 On Monday, November 10th, 2014, Sanford and Judy Jones presented a workshop for teachers and anyone interested in music education entitled, “Music and Movement”. 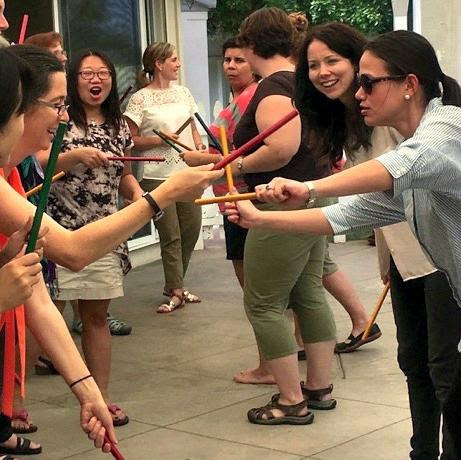 This workshop was designed to help Montessori classroom teachers and assistants, as well as music and movement specialists, to implement a comprehensive and developmentally-based program of music and movement. The exercises and games are appropriate for children in preschool and early elementary grades. 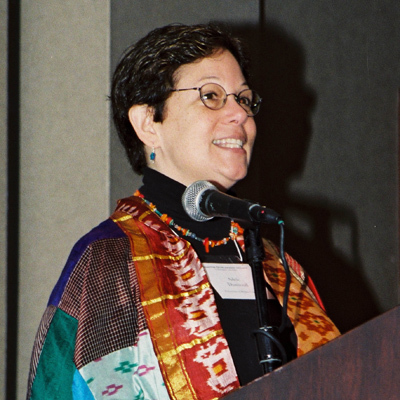 Sanford Jones is known internationally as a Montessori educator, lecturer and composer. He has made significant contributions to the Montessori movement, including the founding and directing of four schools on the East Coast. 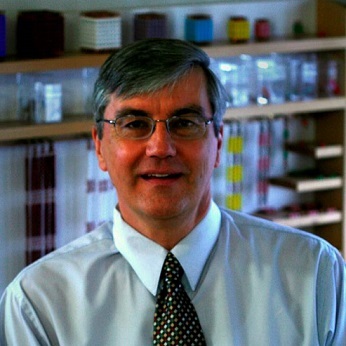 He was the founding president of the North American Montessori Teachers’ Association, and he is a former Executive Director of the Association Montessori Internationale-USA. Mr. Jones, a native of Virginia, did his undergraduate work in music and history at Westminster Choir College, Rutgers University and Roanoke College. A piano and piano pedagogy student of Frances Clark, and a member of Westminster Choir under John Finley Williamson, he taught at Westminster Choir College and The New School for Music Study in Princeton, New Jersey. He is the composer of many songbooks for children and also has created a line of educational materials used in Montessori classrooms internationally. His repertoire of thirteen children’s operas has been performed over 500 times. 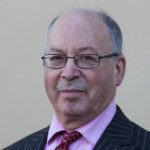 In 2012, he was presented with a “Wisdom of the Elders” award from the Montessori Accreditation Council for Teacher Education in recognition of a lifetime of dedicated service to Montessori education. Judy Jones began her performing career while still in high school, dancing in the Dallas State Fair musicals for two seasons. She then attended the University of Utah as a ballet major. In New York City, she danced for ten years in a number of Broadway musicals, including My Fair Lady, Hallelujah, Baby! and Do I Hear a Waltz? She was in the original cast of A Funny Thing Happened on the Way to the Forum, and she appeared in the movie, The Producers. Ms. Jones owned and directed two dance studios in New Jersey. Later, she directed the Fine Arts Program for the Charles Towne Montessori School in Charleston, South Carolina and served as movement consultant/teacher for the Charles Ellis Montessori Academy in Savannah, Georgia. Judy is certified in the Laban/Bartenieff theory of movement and in Brain Gym Levels I and II of Educational Kinesiology. She holds a degree in Theatre from Armstrong Atlantic State University in Savannah. 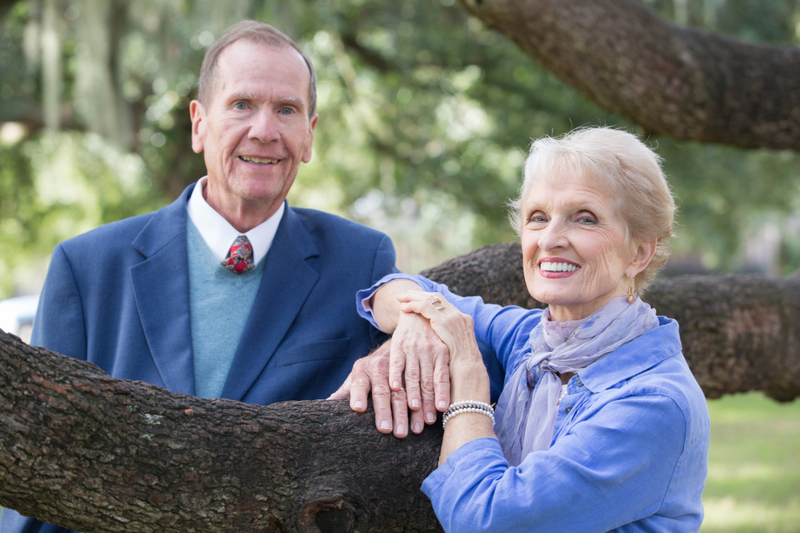 More information on Sanford and Judy’s work can be found at www.youthoperaintl.com. Is Sending Your Child to a Montessori School Right for You? On November 9th, we were privileged to host a lecture by Sanford Jones, a sought-after Montessori teacher and consultant specializing in music education. The lecture was entitled, “Is Sending Your Child to a Montessori School Right for You?” We welcomed parents, Montessori teachers and administrators, and all others interested in the rationale behind sending children to Montessori school! 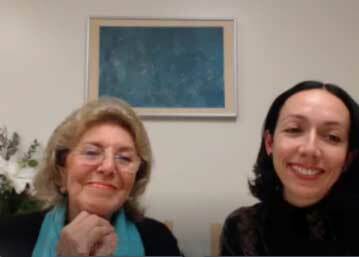 We were pleased to enjoy a spirited conversation between Dr. Adele Diamond, one of the leading researchers on executive functions, and Dr. Silvia Dubovoy, a world-renowned Montessori expert. 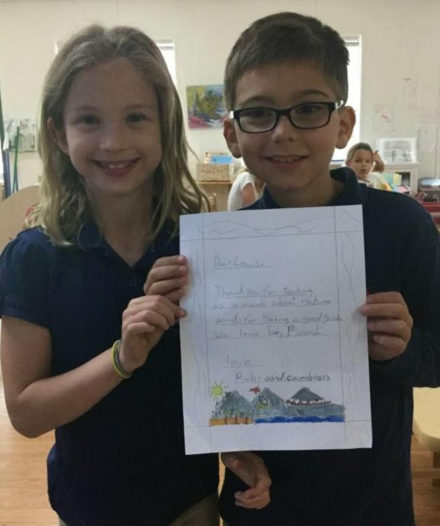 Together, they combined their passions to address the question of how recent discoveries in neuroscience can inform the practice of Montessori teachers. Thanks to all of our guests for attending and making it a very successful and special evening! You can find a .PDF of her presentation here. 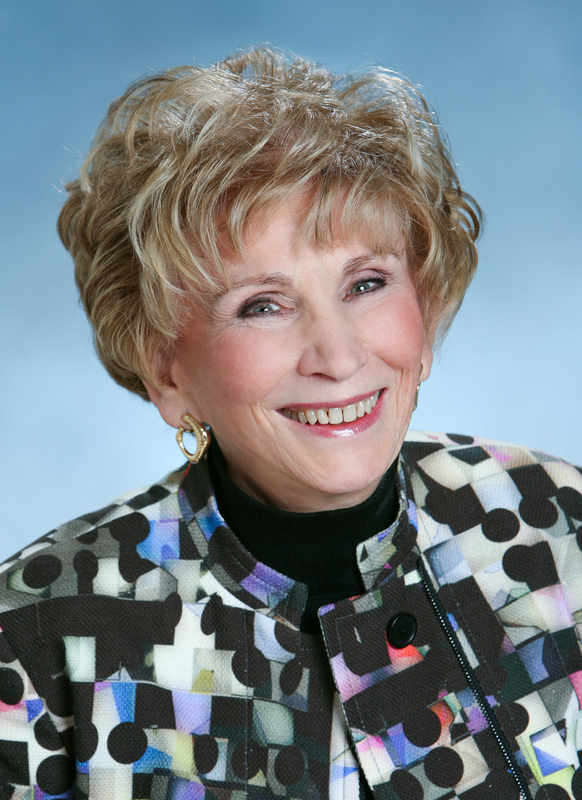 Dr. Edith Eger delivered a mesmerizing talk to nearly 200 aspiring teachers from 25 different countries who were studying this summer at the Montessori Institute of San Diego. Dr. Eger is a sought-after clinical psychologist and lecturer who uses her experience as a Holocaust survivor as a powerful analogy to help people discard their limitations and discover their powers of self-renewal. Over a century ago, Maria Montessori created a vision for the education of elementary-aged children and since that time, her vision has been brought to life in Montessori schools around the world. 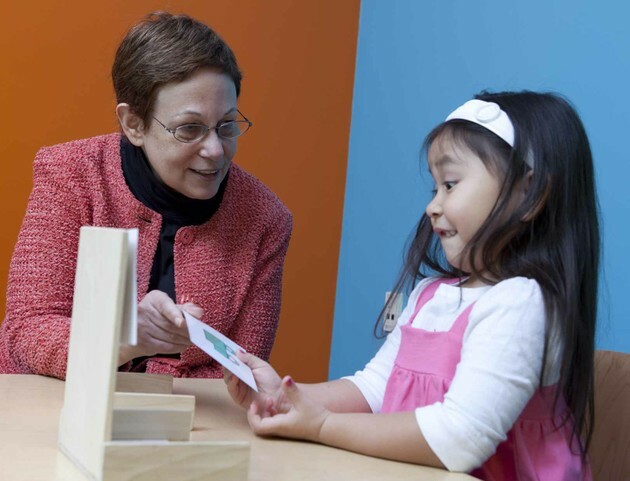 How does the Montessori approach to elementary education compare to the Common Core Standards? 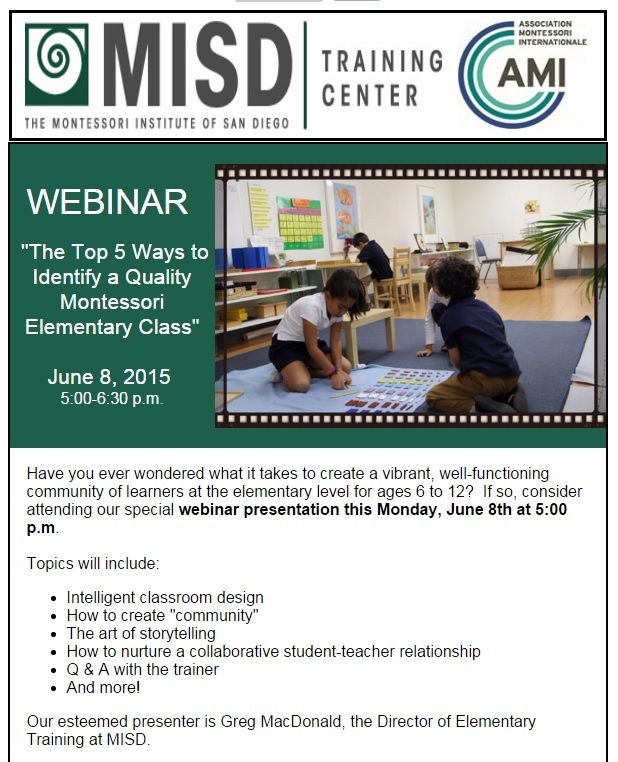 How should Common Core Domains, Cluster Objectives, and Standards be dealt with in a Montessori elementary classroom? Can Montessori education maintain its principles, yet at the same time ensure that children attending Montessori schools are proficient according to Common Core requirements? All of our lovely guests enjoyed this fascinating lecture from Greg MacDonald, one of the Montessori world’s premier elementary teacher trainers. MISD was lucky enough to host a special evening with Paula Polk Lillard and her daughter, Lynn Lillard Jessen, on Monday, April 22nd, 2013 at the Montessori Institute of San Diego. 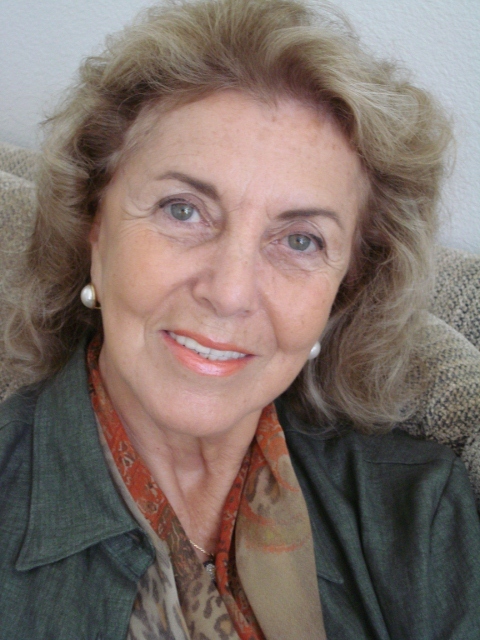 Paula is an internationally respected authority on Montessori theory and practice, and the author of four books, most notably the groundbreaking work, “Montessori: A Modern Approach“, a classic introduction to Montessori written in 1972 and still regarded as one of the clearest descriptions of the Montessori method available to this day. 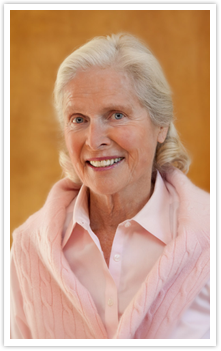 Paula taught in traditional public and private schools for eight years before discovering Montessori. Now, more than fifty years later, after serving on the Board of Directors of the American Montessori Society (AMS) and the Association Montessori Internationale (AMI) USA, co-founding and guiding the development of Forest Bluff School over several decades, and lecturing extensively across the globe, she is here with us to deliver the speech which earned her a standing ovation at the AMI Refresher Course last month: “Montessori and the Human Spirit.” In this inspiring talk, she reflected on how Montessori’s unique emphasis on the human spirit within each child makes possible the realization of human destiny. Paula was followed by Lynn, who spoke on the subject of the book she co-authored with her mother: “Montessori from the Start,” a guide for helping the young child at home from birth on. Lynn’s talk explored the development of concentration and independence during the earliest stages of a child’s life and how those qualities are the necessary foundation for later character traits such as confidence, persistence, and authentic trust in oneself. She demonstrated how the attitudes that very young children form about themselves profoundly impact their eventual relationship with the world. These connections were illustrated through exclusive slides from Forest Bluff School, with a special series following the same child from birth to age two in his Montessori home environment. 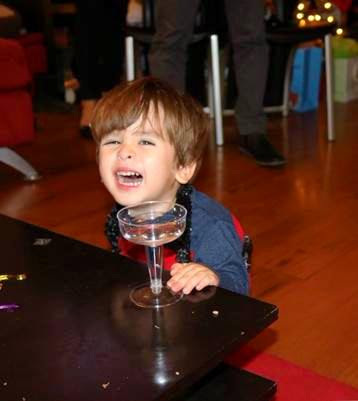 All children are unique. And yet, some have exceptional differences that we cannot help but notice. Terms such as “special needs” put the focus squarely on these differences. However, the ultimate value of these children lies in the skills and talents they bring to the world, and it is the job of society to illumine and celebrate those abilities. If necessary, adults must provide specialized support to assist children on their journey to refine their natural gifts, with the emphasis always being on what the child can give of himself, not what he needs from others. Dr. Silvia Dubovoy highlighted this point through stories of outstanding individuals who have capitalized on their strengths and created fulfilling lives for themselves through meaningful service to humanity.